Someone recently asked me about this technique and my first reaction was that it was probably a little too mundane to cover as a tutorial. But then I got to thinking that there is actually a few interesting things happening here and the style is trendy enough people might be interested. 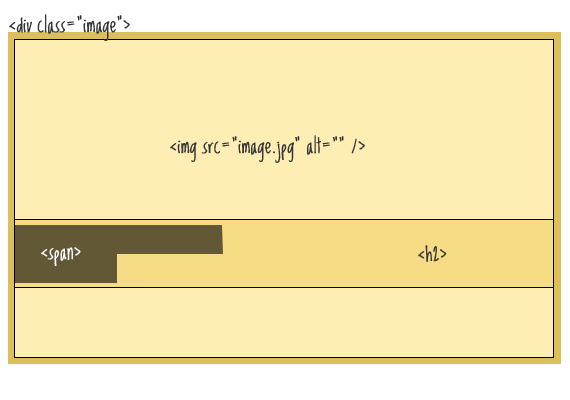 Putting the image in as a background image of the wrapping div would be easier, but in this scenario I see the images as content, and thus belongs in the HTML. We'll use that wrapping div as a container for absolute positioning. This is going to put our text right up on top of the image nicely, but it doesn't accomplish the transparent black box we want to achieve behind the text. For that, we can't use the h2, because that is a block level element and we need an inline element without an specific width. When an inline element breaks, the block breaks immediately after the last character in the line, and begins immediately flush left on the next line. Padding, in this case, does not help us. To solve this, we'll apply some more spans on either side of the <br /> element to simulate that padding. Thx for the rgba thingy. Didn’t know existed. Maybe in the future you can cover some css properties that are not often used but useful. It rgba thing works only in Firefox, Safari, Chrome. Can you guess which one it doesn’t work on? IE. Not even version 8. Sad state of affairs. That’s why the fallback colour is there – so that a solid colour is used where rgba is not supported. Not as slick, but better than nothing at all. I think this is the kind of approach most people are taking where CSS3 and IE are concerned. I did something very similar here (www.qualityreglaze.com) a long time ago. But not with transparency. Good job! BTW. The DEMO in IE7 and Opera is showing a solid black background, no transparency. And In Firefox and Flock, the backgrounds overlap, creating a black line between the two. If you want to make the transparency in IE7 / Opera work, you could set the background with a solid color transparent PNG like in this demo. There is a whole pack of those PNGs in the downloads section. What about the overlapping issue? Then there is the (ehem…) IE6 issue. I know, I said it, sacrilege. Great stuff, I am assuming this can be added to WP and a jQuery gallery? Tutorials on that would be awesome too. Thanks. Thx Chris, u’re awesome mate ! On Safari 4 the spacer background is overlaying the main span making it darker. I think it needs to be reset to not apply the rgba values. I’ve a similar problem with a line where the backgrounds overlap too as Joel. Ah yeah, funny how Safari deals with that (rgba overlapping). I think that’s probably the correct way. But anyway, yet another cross-browser things to be aware of. You can just adjust the line-height to fix the overlapping line. It looks fine in my browser but it may have to deal with slightly different local versions of Helvetica. Hey, what about the jquery funcionality?. I’ve never figure it out, very interesting, it doesn’t need too put extra html code in the definitive html document. Or am I wrong? Chris, would using inline-block on the span fix the padding problem? I haven’t tested it but that was my first thought. Hey Chris – cool post as usual! Couldn’t you eliminate the ‘spacer’ spans by just using ‘& nbsp;’ instead? Originally I used just the spans so I could be super accurate with the spacing, but ultimately I changed the demo to use both the spans and & – as IE didn’t like the empty span (it collapsed it instead of putting the padding onto it). Or couldn’t you just add a margin to the break instead? Nice effect. Looks good on WordPress. Thanks! How would you solve the problem of dynamic text and padding though? Cool stuff. I do this on mouseover instead of having the titles show up right away. Initially I’ll use display:hidden and then use the :hover to trigger display: block so that the text shows. Good post. Keep up the awesome work, Chris. 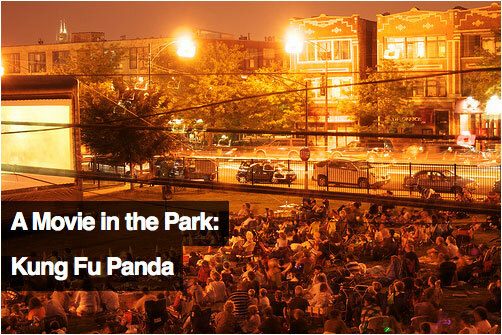 If you’re adding extra markup (and I’d argue that even the ‘br’ is extra markup), why not just use two span elements – one around “Movie in the Park:” and one around “Kung Fu Panda”. You can then position them however you want but the easiest way is just by floating them. See http://www.thinktherefore.co.uk/tests/text-blocks-over-image for an example. Well, if you’re already forcing a ‘br’ into the markup then you could argue that a couple of spans aren’t a big deal. The examples you’ve used imply a sort of sub-headline anyway, which could justify splitting the text into two elements. I was going to suggest the same. I recently had to try to implement this as a hover style for a client and it worked fine until the line broke/wrapped on its own due to length. The only solution I found was to “know” or explicitly trust the break points. If you knew where they should occur and that length would never cause the element to wrap on its own this works fine. However, if you already know the break points, wrapping each in their own span with display:block and float allows the effect with empty spans or breaks. We actually had to scratch the implementation because the content we were using was too dynamic to know where the breaks would occur. If there’s anyone willing to clean this mess up (I’m sure there’s plenty of room to do so), please let me know of your version. It’s an interesting article and I must confess I always liked the labels on top of images. Very cool Jon! I was thinking about plug-in-izing this as well potentially for a screencast. Not trying to compete or anything =) — just think it’s a nice simple example for explaining the concept of plugin creation. Hi Jon, its brilliant. I was also thinking of something like this. And you gave me ready output. Thanks a lot. That’s not ideal, as it will make the text transparent as well. is it possible to make a whole div (which has an image as a bg) to look transparent against the background image of the body tag? Nothing happens when I stick the ” background: rgba(0, 0, 0, 0.7);” in front of the main-content selector. Any Ideas? I’m pretty sure the “background: rgba(0, 0, 0, 0.7)” doesn’t actually make the div transparent, instead it specifies a background colour which is transparent. I really like the look of the text block over the image. Looks very clean. Very cool. I like the look and design of it. Shouldn’t something like this work for the IE666 transparency? Ha! An actual CSS article! Nice one. How would I get the width of the text overlay to be the same as the div it is in, seeing as spans are inline elements? Just don’t use the spans at all then, style the h2 the way the spans are. The reason spans are used at all is to NOT have them stretch the entire width. Chris, thanks very much for getting back to me on this. The method that I had trialed out earlier was somewhat similar but I couldn’t get the background to wrap around the text. Expect a blog post from me soon sharing the link love. Very handy. thanks for posting this. First off, nice new comment thingy! I know it’s nothing big but I always appreciate these small little changes and you notice it for a while. Cool post, not something new but I always use this technique (position absolute in relative) to put play icons on thumbnails and such and it works great. I’m thinking that you can also use negative margins to get the same effect, and I’m pretty sure every browser would react the same way to it and there would be less markup (hopefully) although it’s mostly a hack, and when I saw your post, I just said to myself “position absolute, definitely). I got this to work successfully at my site, in a slightly different manner. This version doesn’t use jquery or spans, but also doesn’t look exactly the same. Note the 2nd slide in the scroller at the top, it shows a multi-line version. The only changes i made were a replacement of the <h2><span> with a single <div>, then a bit of adjustment to the CSS to make it work with the new change. Nice post as usual. Even though you said that this was possibly too basic, it was certainly worthwhile, as I picked up a couple of things, such as the use of jQuery to clean up the code, and the rgba with the alpha channel. From reading the comments, I see it doesn’t work in IE, well I must say, I’m shocked! not! btw im trying to use it with wordpress, is the thing. I just have to say this: such an ill use of h2! That souldn’t be a header should it? I’ve suggested more meaningful markup in a blog post titled Captions over images. I’ve been looking for something like this. But I’m not sure if you noticed, but on the demo page, there’s a black line between the tow text lines. And I couldn’t find any way to fix it. The caption stays behind the slideshow. I dont know how to put the caption at foreground ? I tried this on my site and it worked beautifully. But, unfortunately the CSS was applied to ALL of my h2’s on the page. What do I need to do to contain it and keep it only to the one h2? Hello – I am trying to do something very similar but would like to get the image to align right, with the text box (if you will) aligned left. And then, if possible, I’d like the text box to span the width of the container. So for example if the container is 900px and the width of the photo is 600px, the black transparent box would span the entire 900px width. Sorry for the long explanation – any suggestions? Got a question about this. I am pulling a post title on top of a featured image in a slider. I have a class applied that makes the title wrap into two lines by limiting the line width. My span works but has the ugly spacing issue. Since I can’t add more spans in the php what do I do to fix the ugly aesthetic issue?